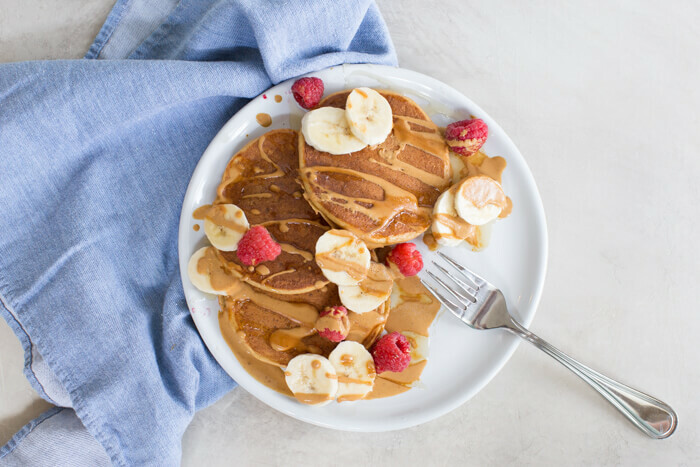 These fluffy peanut butter protein pancakes are protein packed with cottage cheese and peanut powder and made straight in the blender for easy mixing. 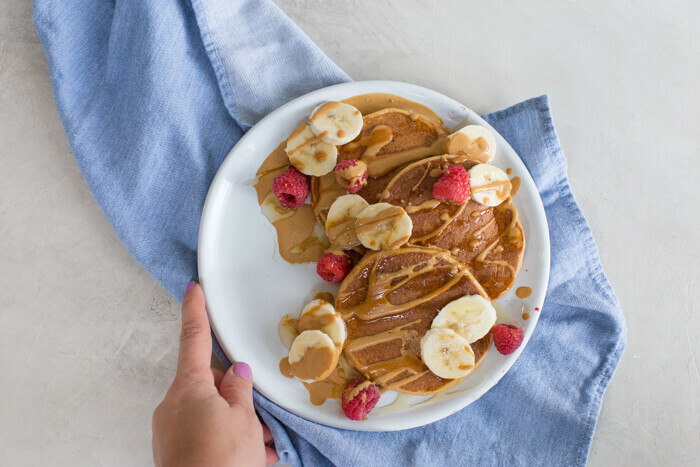 Meal prep these peanut butter protein pancakes to freeze and reheat for quick breakfast, brinner, or pre/post workout fuel. Each pancake has 5 grams of protein! 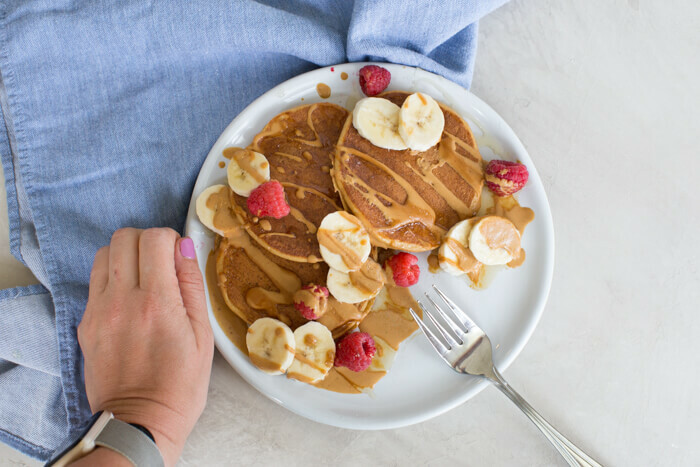 If you do a short stack of 3 pancakes– you’d get 15 grams of protein for only 225 calories of pancake yumminess, ANNND if you’re feeling a little extra, top on some cottage cheese or peanut butter for an even bigger protein boost. We love pancakes over here. And I know you do too because they are some of the most popular recipes on my site. You guys when you send me comments like this on my recipes or make one of my recipes and tag me on instagram @kristinalarueRD #loveandzest, I’m over the moon thrilled. It makes my day knowing that you and your family are enjoying the recipes that I’m sharing from my kitchen to yours. 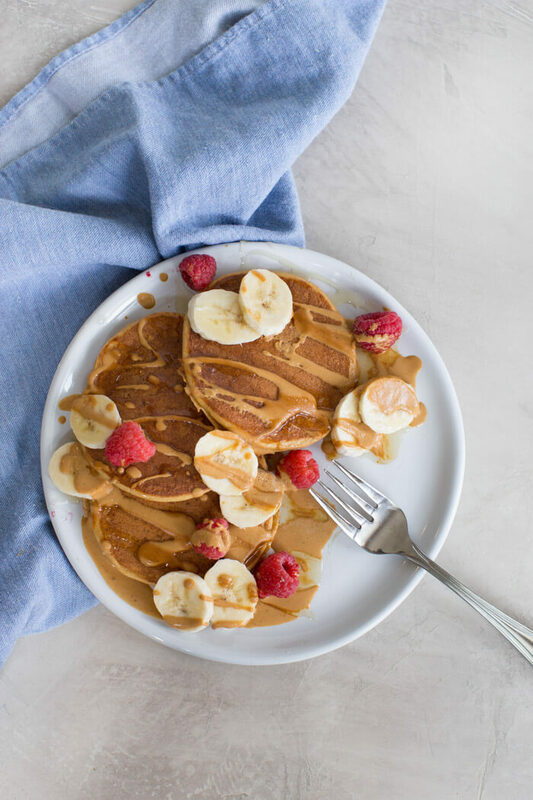 This recipe for peanut butter protein pancakes is made with white whole wheat flour, but you can sub in gluten free or regular all purpose one for one in this recipe. I have not tested these with coconut flour or almond flour, either. And I’m not sure how they would turn out. This recipe doesn’t call for as much wheat flour because of the peanut powder used acts like a flour. YIPEE! I prefer using the whole wheat flour in this recipe because the end result is light and fluffy, but still highly nutritious and packed with protein from peanut powder and cottage cheese. I’m not one of those people that wants to eat cardboard-like pancakes or a “egg-y” or straight “cottage cheese-y” pancake. YUCK. I know some of you peeps are use to that in the name of eating healthier, but not this mama. If I’m going to eat pancakes there are some flexible rules…. like. 1) Pancakes must be fluffy. 1-b) crispy edges get bonus points in my book. 2) All pancakes must have a butter spot. My son hates the butter spot– you know that spot on the pancake that’s pooling in warm butter. Yeah, he always wants me to move that off his plate and onto mine. #momwin! 3) I must have a drizzle of maple syrup on all pancakes. I mean I’m cool with other toppings too, but real maple syrup is a must. 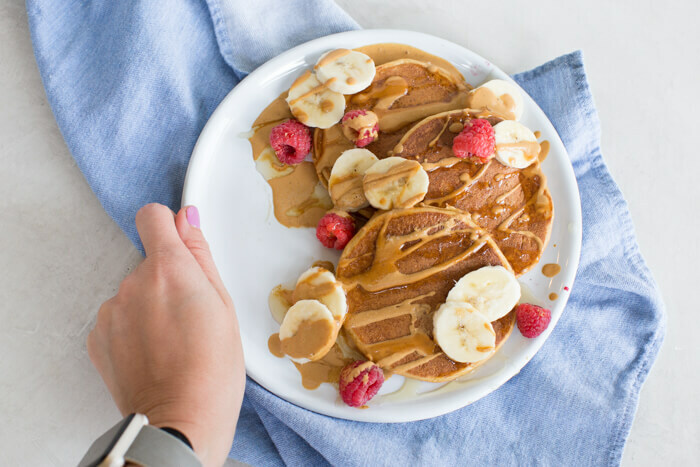 If you agree with me on pancake perfection, I hope you give these Peanut Butter Protein Pancakes a try! And some of my other favorite pancake recipes on the blog! See what I mean…. we love us some pancakes around here. In a blender, add cottage cheese and almond milk and blend until smooth. Add eggs, vanilla, maple syrup, and baking powder to blender and pulse just until mixed. Add peanut powder and flour to blender and blend until fully incorporated, taking care not to overmix batter. Heat non stick pan over medium-low heat; coat with butter or coconut oil. When butter starts to bubble, pour batter into pan. Flip when surface of pancake starts to form bubbles; cook until both sides are golden; remove from heat. To freeze pancakes, stack pancakes with wax paper in between layers and place in freezer safe bag.